© Robert L. Carr. Flora of Eastern Washington and Adjacent Idaho. web.ewu.edu (Accessed 1/2018). Dysphania botrys (Jerusalem oak) hairs on stem. Pamela B. Trewatha, Missouri State U., William H. Darr School of Agriculture. courses.missouristate.edu (Accessed 1/2018). 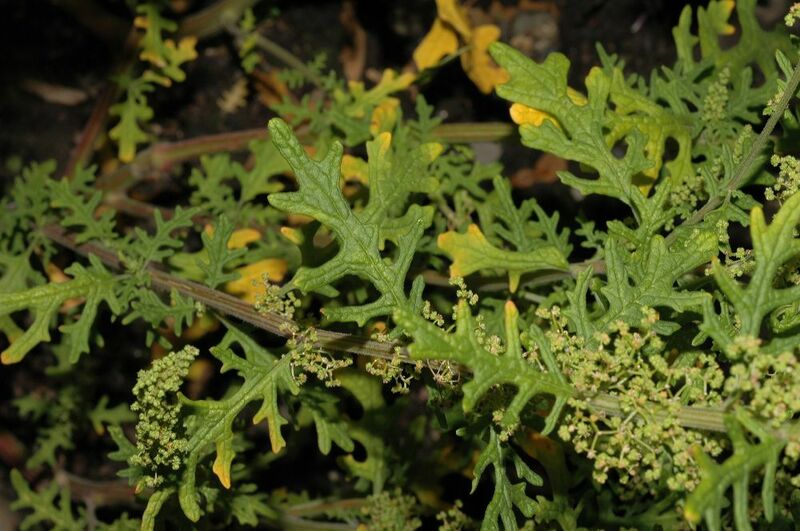 Chenopodium botrys is an annual C3 herb (Jacobs 2001), to 60 cm, glandular-hairy, sticky, strongly aromatic. 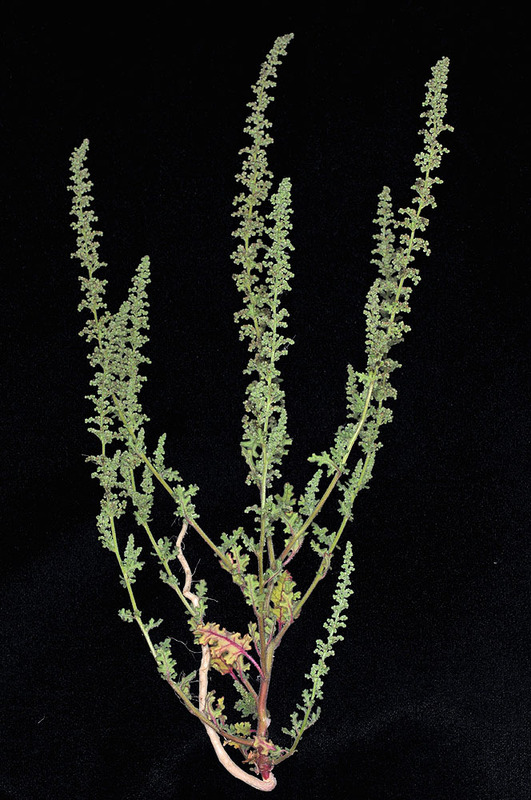 Dysphania botrys (Chenopodium b.). leaves and flowers. © 2004 by Kevin C. Nixon. fossilflowers.org (Accessed 12/2014). Leaves alternate, pinnately lobed or divided, lobes blunt-toothed, lower leaves to 8 cm long, upper leaves much smaller. 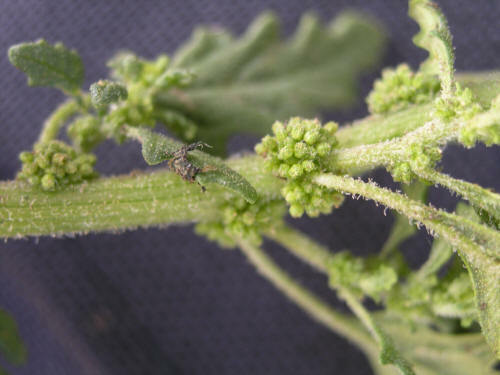 Dysphania botrys (Chenopodium b.) flowers. © Robert L. Carr. Flora of Eastern Washington and Adjacent Idaho. web.ewu.edu (Accessed 1/2018). 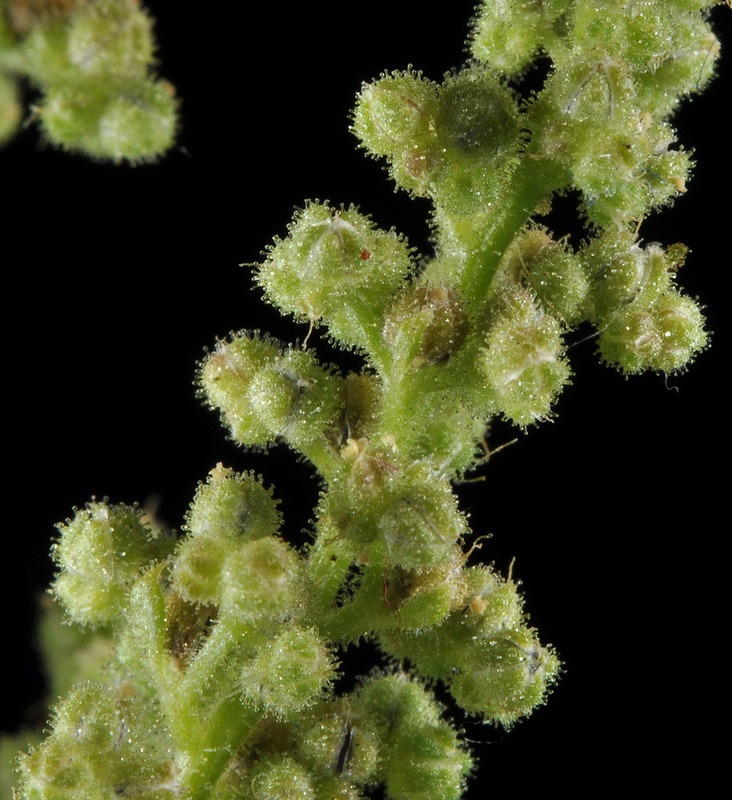 Flowers minute, dull, calyx deeply 5-lobed, glandular-hairy, inflorescence sender branched. Fruit dry, 1-seeded, seeds mostly horizontal 0.6-0.8 cm blackish, no margin; blooming and fruiting July-Oct.